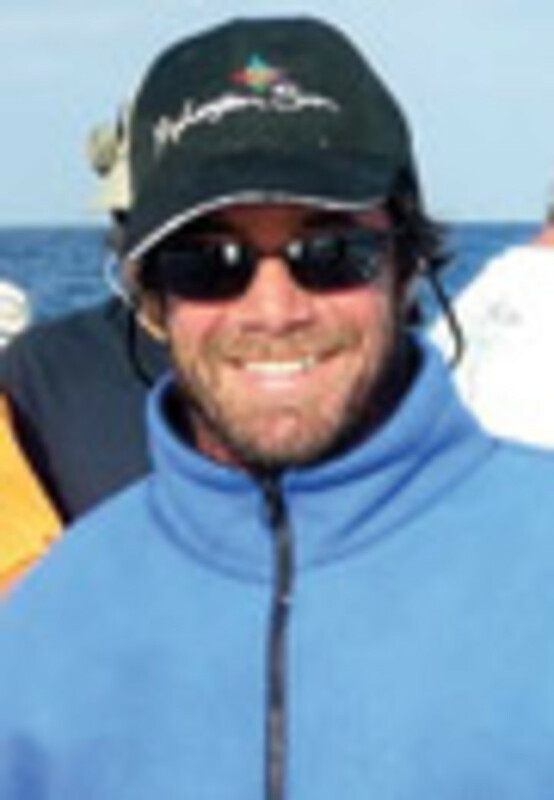 Scott Lief has always loved fishing and being on the water. So as the Simi Valley, Calif., president and chief technology officer of a computer company was approaching 40, he started to get into serious boating. A 14-foot Tracker got him out bass fishing on California lakes, but ocean waters beckoned. 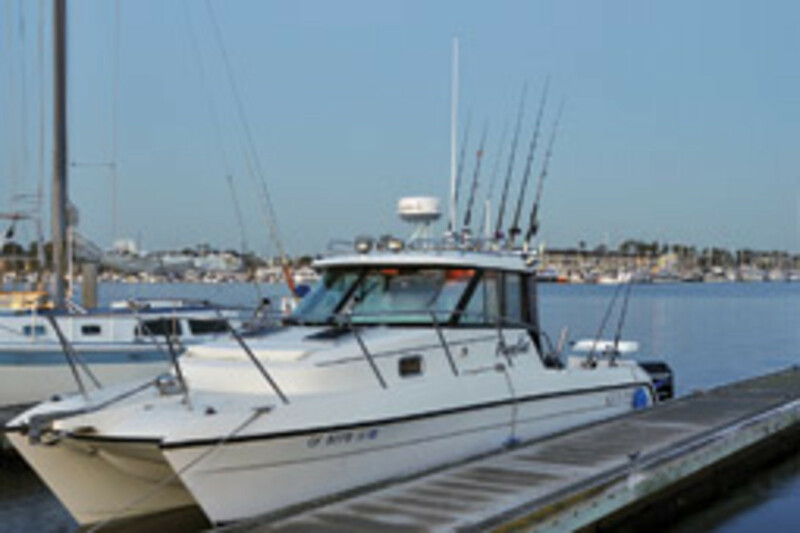 Moving up to a 20-foot Trophy walkaround, he fished the coastal waters off his hometown of Santa Barbara. But even that boat was only enough to whet his appetite. 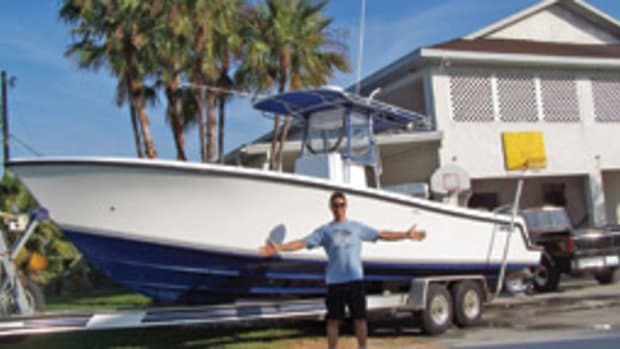 With those criteria in mind, Lief started posting to and reading various boating and fishing forums to gather enough information to make an educated decision on a boat to buy. He kept running across the name Glacier Bay, the Washington-based power cat builder. The Mercury OptiMax 150 outboards had 600 hours each and compression tests went well. Some pumps needed replacing and Lief ran across a few other minor issues, all of which were “within my abilities to address,” he says. “Truth is that I think I knew I was going to buy the boat before I saw it. I had done my research, and the only thing that would hold me up was if it were a wreck or if we couldn’t agree on a price. I am very good at electronics and mechanical stuff, so when I made my offer, I knew what I was getting into and what was ahead of me.” The final price was around $29,000. Last season, he changed out both engines, replacing them with 2005 OptiMax 150s. “So I swapped out all my old gauges with the latest Mercury SmartCraft monitors and system link gauges,” says Lief. Cruising speed with the “new” engines is about 27 to 30 mph, and the engines burn about 1.8 to 2 gph at that rate. Top speed is around 40 mph. All in all, the Glacier Bay 2680 has delivered just what Lief expected. 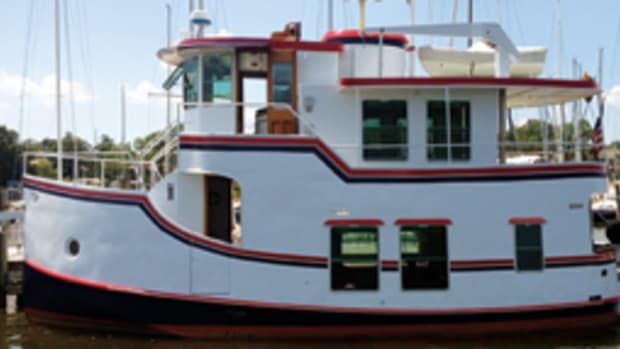 “The boat has a decent-sized cabin with a queen bed. The cockpit is well laid out with space for flush-mounted electronics and seating for four. The rear deck has room to fish four guys and up to six rods. 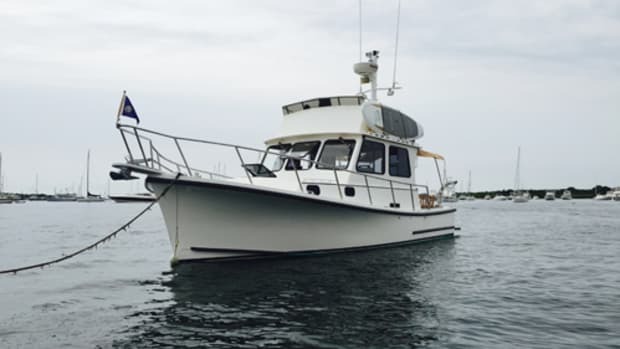 After all my updates, she runs like a new boat and gives me the peace of mind to go where I want,” says Lief. The Glacier Bay 2680 Coastal Runner is a displacement power catamaran designed for speed. The hull has a heavy-duty grid system and Kevlar reinforcement for strength and durability. The profile shows high sides and an even sheer leading to a low reverse transom with integral swim platform alongside the twin outboards. Above the rail, there’s a trunk cabin surrounded by walkaround side decks and a bow rail leading aft to the hardtop wheelhouse and cockpit. The helm station is to starboard, with additional seating, including an optional lounge, to port. A mini-galley/bait prep station with a sink and cooler/storage is abaft the helm seat. 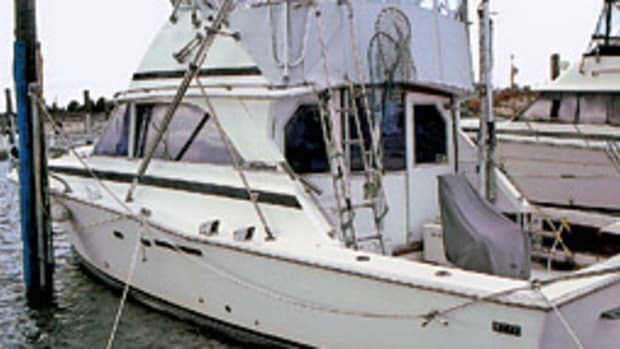 The cockpit has more than 50 square feet of space, and standard fishing gear includes a tackle station, four rod holders, four rocket launchers and two rod racks for up to four rods. 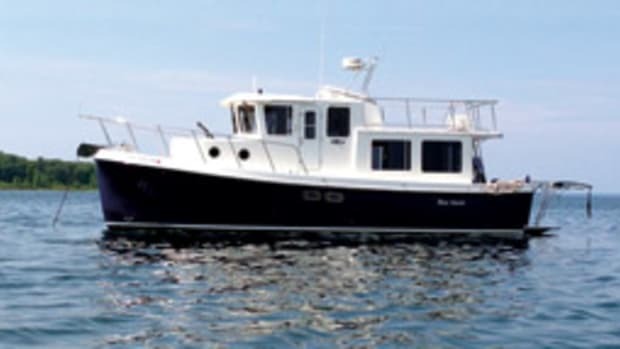 There’s a 27-gallon live well and a pair of insulated 54-inch fishboxes, as well as a raw-water washdown and transom shower. The cabin has a queen-sized berth to starboard, with storage to port. The marine head is forward in the port sponson. Based in Monroe, Wash., Glacier Bay was founded by Larry Graf, who began developing recreational power cat designs in the late 1980s. 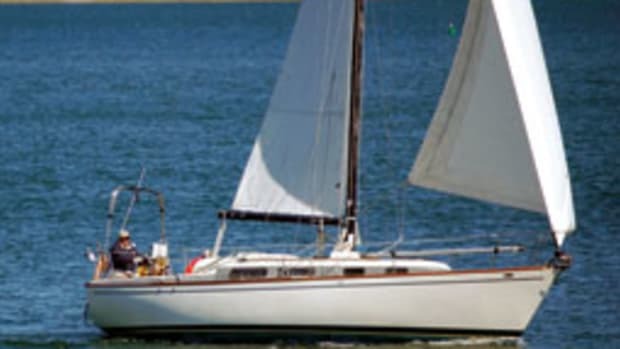 An experimental 22-footer led to the first Glacier Bay cat offered to the public, the 248, which debuted in 1990. Powered by a single 90-hp outboard, it proved popular and set a standard for workmanship and performance. In 1995, to show off the power cat’s capabilities, a 260 Canyon Runner made a non-stop 728-mile run from Virginia to Bermuda. Two years later, a 2680 Coastal Runner traveled almost 1,400 miles from Hawaii to the Marshall Islands and more than 2,700 miles from the United States to Siberia. 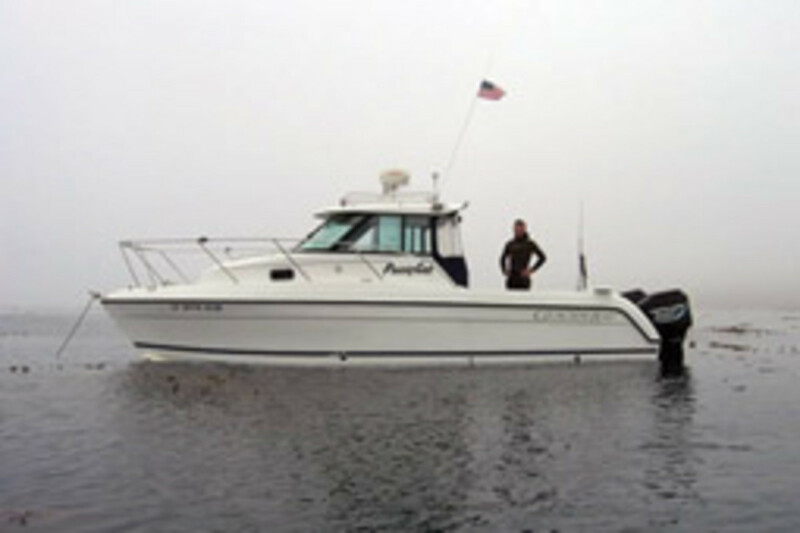 More Glacier Bay models followed, including a 34-footer, the largest in the company’s line. 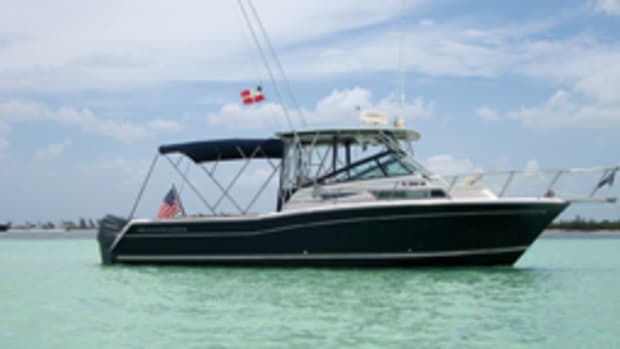 The builder changed hands earlier this decade and recently merged with Tarboro, N.C.-based World Cat, another power cat builder. The new company continues to offer models from 22 to 34 feet under the Glacier Bay nameplate. 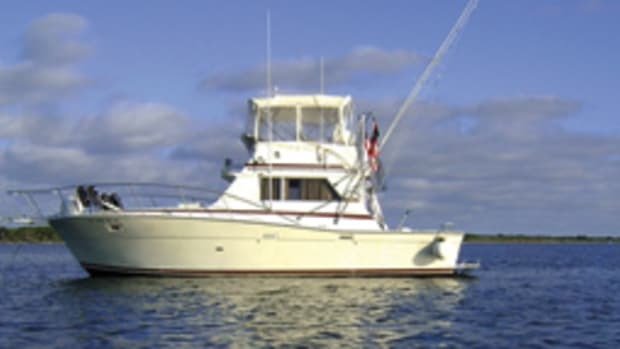 Used 2680 Coastal Runners run from around $40,000 to $70,000. Builder: Glacier Bay Catamarans, Monroe, Wash. This article originally appeared in the January 2010 issue.